There is a steadily growing number of sports boats on the Swan; sail craft around six metres long, essentially big racing dinghies with ballast keels. Terrific fun, but needing athletic dinghy-style crews to sail them well. And they are purely racing boats where most racing is done by keel boats that have other careers as cruisers. A new entrant to the scene goes some way to bridge the gap. The J70 is the latest product of the builder that gave the world the extremely successful J24, so it has a respected pedigree. A shade under the seven metres suggested by its name, it combines 21 square metres of working sail area with a displacement of 794 kilos. 36 percent of that is ballast on the end of a 1.45m keel; these are figures that suggest an easily driven, stable and fast boat. A clue to the easily driven nature of the J70 was provided by the choice of auxiliary power: a 2.5hp Suzuki that was far from working hard when called into use. 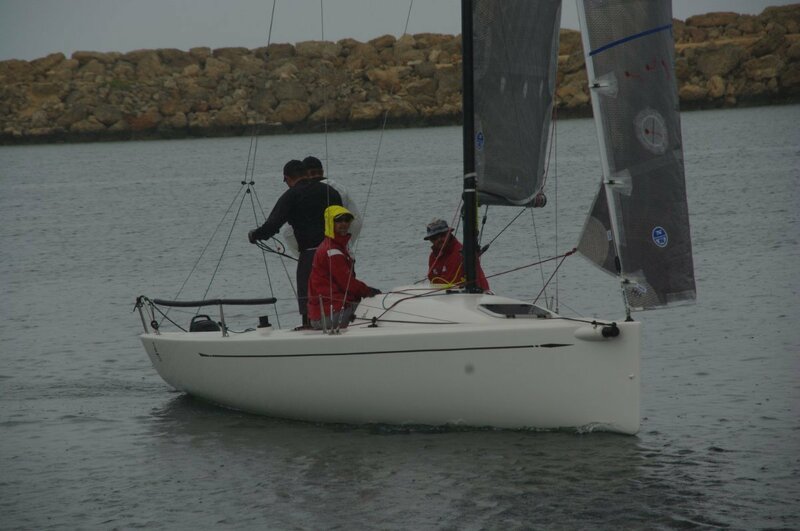 WA’s first J70 had its maiden voyage on Fremantle Sailing Club’s opening day, with everything new to its crew. It was launched off a trailer, its lifting keel making this possible and simple. The routine of lowering and securing the keel, stepping the featherweight carbon fibre mast, tensioning the standing rigging and bending on the sails was quickly mastered. The routine is so straightforward it could probably be achieved in 20 minutes if money were at stake. Winds on the day were flukey, with some respectable gusts. As soon as anything near ten knots cropped up the J70 was up and boogying, impersonating a lightweight dinghy. The crew for the day comprised four sizeable males, adding substantially to the displacement. The performance suggested adjusting crew numbers to wind strength would be a useful ploy. It is illuminating to do a few sums on displacement and sail area with a lightweight vessel like this. We have all seen the pictures of seriously large racers with a dozen or more crew members sitting on the weather rail as organic ballast. Compare their vast sail area with the J70’s and see how much more affect a couple of 80 kilo people sitting on the J’s rail has. And the J70 has the shape and equipment to make this a natural and comfortable position. But the J70 can have a life away from racing. Overseas, where this is a runaway big selling boat, it is a popular family or married couple craft for weekend fun with the occasional race. Loners can enjoy single handing in it. For the most social and laid back racing – twilights – the cockpit can accommodate eight or more as well as the esky. The small fore cabin has V-berths long enough for use by humans, and weekending is very much an option. Overseas experience says a big use of the cabin is for children, sated with sailing, who can migrate there to play with electronic toys rather than asking if they are there yet. The layout is uncomplicated allowing single handing; from one position the skipper can control the adjustable backstay, main and jib sheets. Extending the bowsprit and setting the asymmetric spinnaker, though, will call for few more hands. There is a pair of sheet winches that are likely only to get much use in stronger winds. These and all the other hardware are satisfyingly beefy items, well up to their jobs. So far there is just the one J70 afloat in WA, but more were ordered at the Mandurah show. If overseas experience is any guide there should soon be enough here for one-design racing. 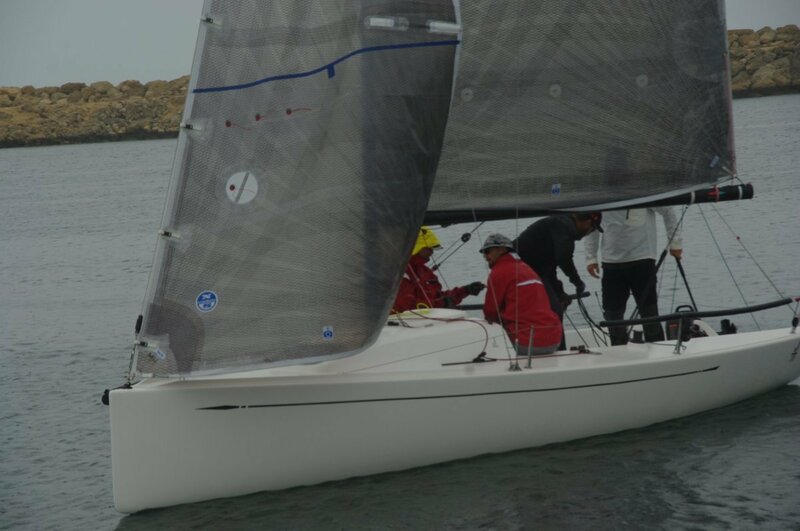 The worldwide numbers grew so fast that less than 18 months after launching the International Sailing Federation approved the J70 as an ISAF class. The first world championship was held last month the entries capped at 120.